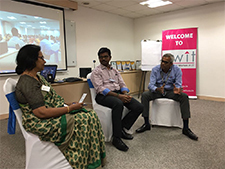 eWIT organized a panel discussion on Robotic Process Automation, one of the hot topics of the day. GAVs Technologies, one of eWIT Corporate Members were too excited to host the event at their premise. 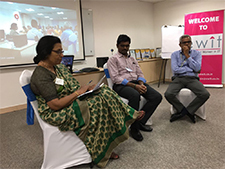 The speakers – Mr. Ganesh Raj Mohan, Mr. Ganesh Raj Mohan, Associate Vice President, Sutherland Global & Mr. Srinivasan Sundararajan, Vice President-Technology, GAVs Technologies readily agreed to be on the panel. The event started with Ms. Nirmala Gopalakrishnan, eWIT President welcoming the gathering and spoke about eWIT and its activities. Further, she invited Ms. Radhika Chandrashekar, eWIT GC member and immediate past Vice President of eWIT to moderate the session. Ms. Radhika introduced the panelists and gave a brief on the topic. She started with asking questions to the panelists. While answering the questions, Mr. Srinivasan said Robotic Process handles human side automation. It considers human point of view and it depends on how much human intelligence is needed. Mr. Ganesh stated that RPA is different from other processes in terms of scaling and cognitive capabilities. Mr. Srinivasan suggested that while starting with RPA one need to start with small process and to move gradually with complicated ones. Mr. Ganesh shared that the success rate of buying pre-programmed ones are 40% and it costs a lot. He added Sutherland RPA is custom built. While answering question of RPAs effect on job market, Mr. Srinivasan said the low skilled workers must upgrade their skills to retain the job. He also added that it takes off job from one place and adding it in another place. While answering question on RPAs future, Mr. Ganesh said it all depends on scaling of the particular module. He further added that Artificial Intelligent which comes with lot of cognitive capabilities is going to be the future RPA. Regarding risks involved in RPA, Mr. Ganesh said when expectation is not 100% the success rate will also not be 100%. Mr. Srinivasan said improper implementation, over intelligence are few risks involved in RPA. He added that RPA should be used as a support tool and not as supplement tool. Both the panelists answered questions raised by participants. The evening ended with thank you note from Ms. Sarada Ramani, eWIT Advisor and immediate past president.